Can I get an amen? TV has announced its new We’re the Cambells TV show will premiere on Tuesday, June 19, 2018 at 8:00pm ET / 7:00pm Central. 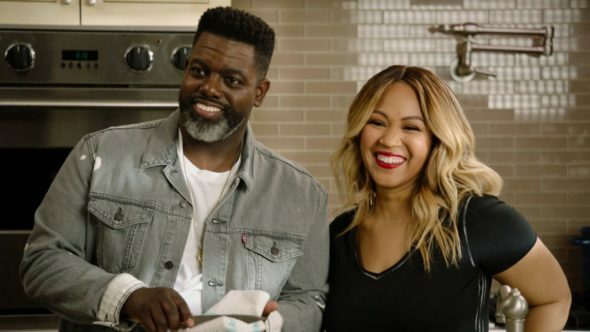 The series follows Gospel entertainers Warryn and Erica Campbell, and children Krista, Warryn, and Zaya, as they try to balance work and family life. A TV One reality TV series, We’re the Campbells features Warryn, a pastor and music producer, and Erica, half of the Gospel duo Mary Mary. The show also features Erica and Warryn’s mothers, Thomasina “Miss Honey” Atkins and Sandra “Momma” Campbell. Learn more about We’re the Campbells from this TV One press release. SILVER SPRING, MD – May 16, 2018 – TV One is set to premiere its latest original docu-series, WE’RE THE CAMPBELLS on Tuesday, June 19 at 8 p.m. ET/7C. The nine episode docu-series will give viewers an intimate glimpse into the lives of Gospel entertainment power couple Warryn and Erica Campbell, as they tackle the everyday struggles that come with balancing family and work, nurturing their marriage, building their individual careers, and fostering their faith; all while raising their three children Warryn, Zaya and teenager Krista. TV One will also feature the couple in its ongoing online series #BLACKLOVE and a digital exclusive after show …WITH WARRYN & ERICA. The weekly online companion content will get up-close-and personal with Warryn and Erica, as they reveal how they have dealt with common issues that could make or break any relationship. Dividing time between her family’s life in Los Angeles and her work life in Dallas, Erica Campbell is not only a doting wife, mother and sister, but also a host of the popular nationally-syndicated program Get Up! Mornings with Erica Campbell on Reach Media, which she tapes daily. In addition to these roles, she is also one-half of the award-winning Gospel music duo Mary Mary, writing a new book, promoting her hair extension and wig collection and serving as First Lady of the family church. What do you think? How do you like the sound of the We’re the Campbells TV series? Do you think you’ll check it out on TV One, this summer? More about: TV One TV shows: canceled or renewed?, We're the Campbells, We're the Campbells: canceled or renewed?